Have you heard of lionfish? Gracefully beautiful but venomous. Sweetly delicious but invasive. The con's really are more detrimental than the pro's, and they are important. 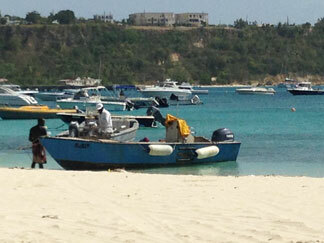 Anguilla is aware of this more recent invader to its waters. Trackers of this Pacific region native watched as the genus population (scientific name: Pterois), slowly grew and grew and expanded its territory. Its presence in the Atlantic Ocean has become abundant over recent years and efforts to control the growing population has not been successful as this genus moved south. 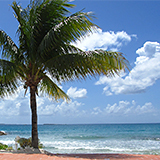 Today, it is present in the Caribbean. 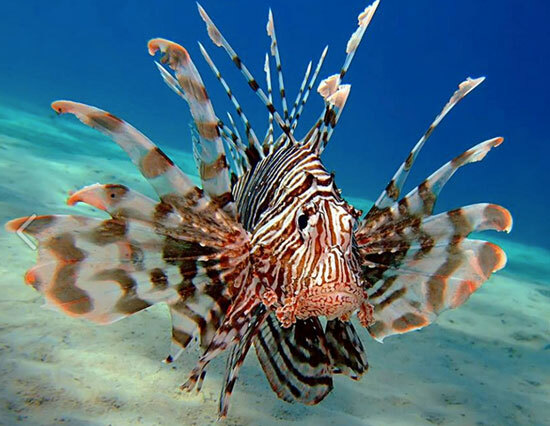 Anguilla's first reported lionfish sighting took place in 2010 when Douglas Carty (aka Dougie) of Special D Diving spotted one off of Anguilla's western coast. There are not as many natural predators of the lionfish in the Atlantic and Caribbean waters, making it a threat unlike in the Indo-Pacific region where it is less notorious. Since finding their way to Anguilla and the Caribbean region, it seems as though every local Anguilla diver has kept an extra eye out when on dives and make attempts to catch/kill lionfish. My first home-cooked lionfish. Filleted in my yard. Seasoned with salt, pepper, garlic powder and turmeric. Sauteed in coconut oil. Perfect! I have not heard of any incidents but visitors are warned not to attempt to get close to them while snorkeling or diving as catching them and handling them from sea to land is only being done by select and experienced fishermen and divers. I gather that the divers aren't necessarily looking for the somewhat heroic title of "lionfish slayer" but it's only natural they are the heroes and have a good insight of how many there are and where they are showing up in Anguilla. After all, they are the ones more constantly at the reefs where any present lionfish prey on smaller fish. The fishermen are also becoming more enlightened to the fact that lionfish are a threat to the ecological systems as they don't have a lot of natural predators with exceptions to other heavily fished species of groupers. 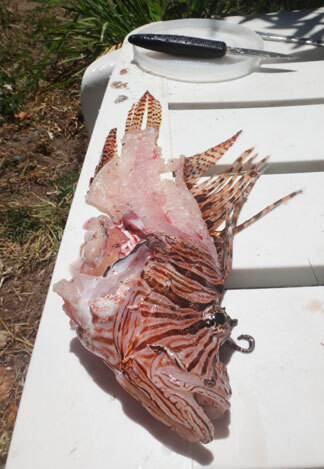 And the effects are being felt by the fishermen as the lionfish are preying on snapper - a popular menu item important, thus important to fishermen's inventory. Before the restaurant demand for lionfish was present in Anguilla, ironically the lionfish were being caught by local fishermen hoping to catch lobsters and snapper. They were unwanted stowaways. Fortunately things are slowly changing. Thanks to a few of the local restaurants expressing interest, more and more fishermen are selling the lionfish as opposing to freeing them or simply killing them and letting them go in the ocean. It's with hope that the demand for lionfish will help balance out the increasingly diminishing snappers as lionfish is scrumptious and a fine replacement for snapper. 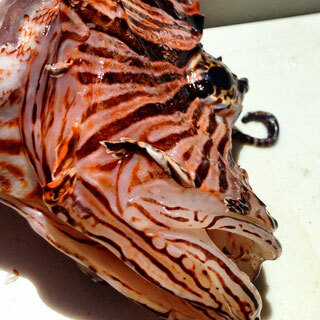 Where Can You Eat Lionfish In Anguilla? Just as Anguilla's indigenous crayfish is sweeter than most lobsters, the lionfish is prized for its tender, sweet meat. The only other fish meat that I've had that is similarly sweet is barracuda. Now that we know that eating lionfish is not only delectable but it serves an important purpose too, how does one taste it in Anguilla? Update: Since this article was written, the demand for lionfish seems to have somewhat diminished. You can still find lionfish on Dad's Bar & Grill's menu (described below) and occasionally at Mango's when they have it on special. It, however, is no longer available on a semi-regular and regular basis at Straw Hat and Pumphouse respectively. We will be keeping our eyes and ears open for spots where you can sample lionfish regularly and will update this page. 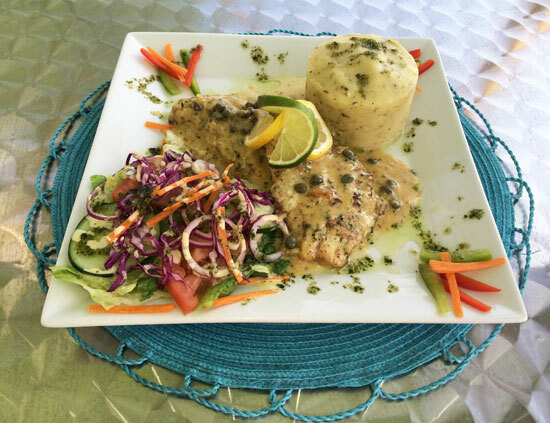 If you have any tips and have tried this tasty fish in Anguilla, please share your experience here! 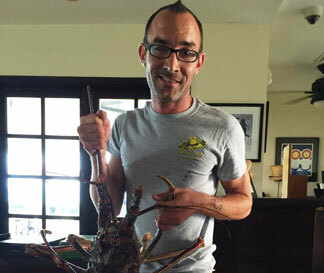 Anguilla's chef that's leading the way in creating a demand for lionfish is Nick Dellinger of Straw Hat restaurant. Nick has communicated to the local fishermen that he works with directly that lionfish is "most wanted". Letting the fishermen know that their initially unwanted by-product catch of lionfish will now bring them money and help the reef ecosystem makes them more of a targeted fish than in the past. Once more, this also helps the snapper population since they are both preyed upon by the lionfish and fished. Like many kinds of fish their locale is unpredictable. This makes it tough to feature lionfish as a regular menu item, such is the case at Straw Hat. Their opening hours and popularity would demand a larger quantity in order to be served regularly. But, when it's available, you should know that Chef Nick will do something creative and tasty with it as a special of the night! Nick is so dedicated to helping control the lionfish population and serving his clientele the special treat of lionfish, that he himself is the doing the filleting of the fresh, locally caught lionfish supplied to him by the fishermen. This is a risk since the spines of the lionfish are venomous. I asked Nick if he had ever been stuck, stung, or whatever one calls the unwanted insult of a lionfish. His answer was "yes". In his early dealings with lionfish, late one night, alone in the kitchen, Nick caught a sting to the hand. Not his first job-related injury, he kept his head about him and quickly ran hot water over the point of contact. Nick had been told that 'hot' neutralizes the venom. He thinks it must have worked because while it did sting and burn a bit, he had no other side effects from it and was not swayed from filleting them in the future. In fact, he told me that the spines can be boiled and used for skewers on something like a lionfish wrapped plantain. Genius! And what a presentation! This was not surprising coming from Nick, he's a creative, talented and driven chef. 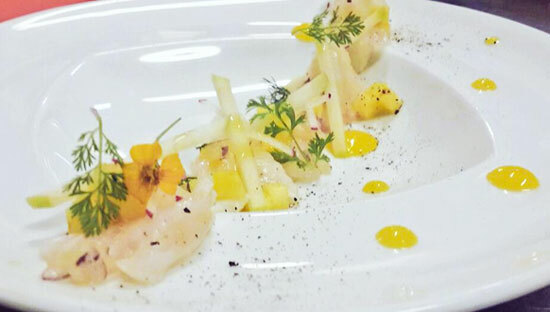 If you're on Twitter, it's fun to follow Nick as he creates plates for his clients to enjoy such as lionfish ceviche, directing his lionfish tweets to @KillTheLionfish and @FightLionfish. Chef Nick is @chefngd. When you are in Anguilla and looking to help the cause and indulge on this mouth-watering fish, be sure to check in with Straw Hat to see if Nick has gotten his hands on some for a lionfish special. Keeping in mind that all meals from the sea depend on ocean conditions and fresh catches, The Pumphouse and Dad's are two restaurants that have voiced demand to their fishermen for it in order to have it as a regular menu item. The Pumphouse: "I'll Have the Lionfish, please." The Pumphouse is a natural fit for such a cause too. 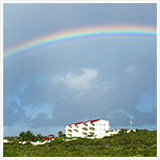 Well established, it's upscale yet rustic and a trendsetting renegade that's connected to history of the island of Anguilla. Its owners, a conscious and seafaring family, provide no surprise that they would be behind something so important to the environment and exciting to your tastebuds. 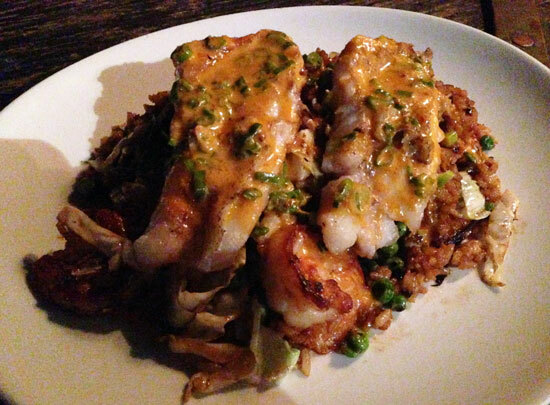 The Pumphouse's entree makes the lionfish filet the centerpiece of an array of flavor galore: it's described on their menu as "Saute Lionfish & Shrimp Fried Rice with Red Curry and Mango. It sells for $22 US and is really good. I've also found no bones when dining on The Pumphouse's lionfish plate - a true filet. Everyone I've been with that has ordered the lionfish at The Pumphouse has been pleased and loves the little kick of heat and Asian flavor in the mix. And not only does The Pumphouse provide a nice portion of lionfish, the fried rice is full of sizable pieces of shrimp which are a nice compliment to the dish. Dad's Bar & Grill is the other spot to look for lionfish regularly on the menu. Their lionfish entree sells for $30 US, is topped with a caper cream sauce and served with vegetables and cole slaw. 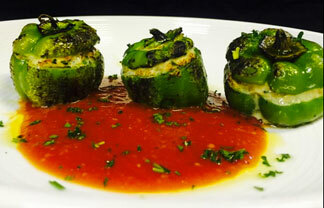 The caper cream sauce is decadent and still allows the flavor of the fish to come through. The sides vary from time to time but are good accompaniments. One note: Don't get too excited over the flavor and swallow too quickly because a small portion of the fish will have a few little bones to navigate. Nothing to be overwhelmed by if you aren't used to having any bones at all - and it's worth it. Lionfish are graceful, eye-pleasing, beautiful fish with a mean appetite for preying on heavily-fished fish and without many predators of their own. If you are a fish eater and like helping a good cause, the next time you are in Anguilla (or anywhere lionfish is a threat), seek it out. Find out if Chef Nick at Straw Hat has any lionfish on the menu for that day and if so, go get it. Mid-day, go for a lionfish lunch on the beach at Dad's. 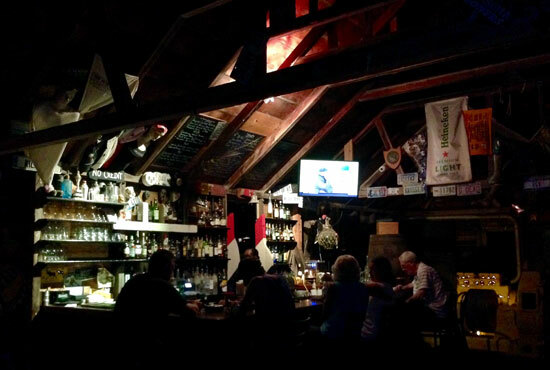 And last but not least, enjoy yourself at The Pumphouse for your lionfish dinner. 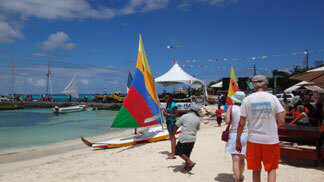 You can also visit Anguilla over Easter weekend and subsequently enjoy the growing Festival del Mar. You may have to ask around but you can find lionfish being served at a few of the festival tents. You can also always check with the Anguilla National Trust to find out other ways of helping with the control of the predatory lionfish. A big thank you to Nick Dellinger for sharing his knowledge and images, to The Pumphouse for generously sharing their flavorful lionfish entree and to Dad's for the image of their beautiful lionfish plate.